Think of your resume as an elevator pitch. 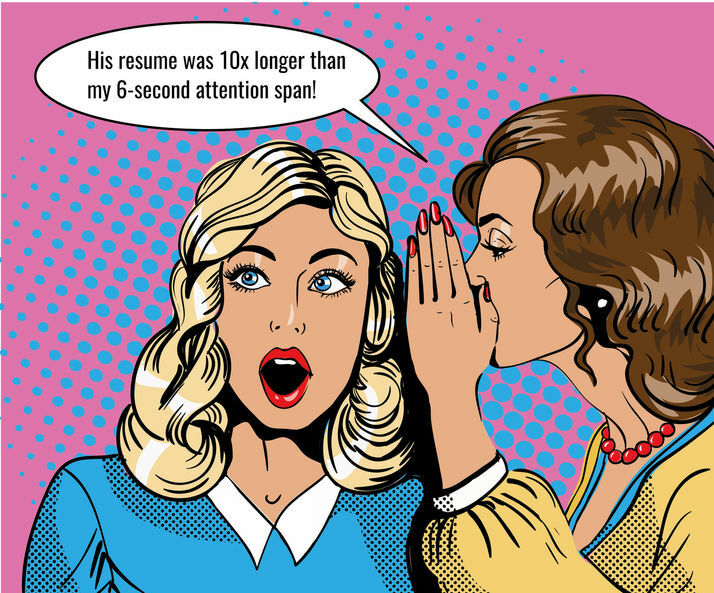 You’ve got six seconds to wow the recruiter and get an interview invite. In this case, length is absolutely crucial, but how long should a resume be? How long should a resume be exactly? Should it be as short as possible? Is one page the golden standard? Is it cool to staple novel of your achievements together and proudly drop the stack off on the hiring manager’s desk? We will look at the pros and cons of different length and what an ideal resume should include. If you don't have a resume to work with yet, check out one of these resume templates. Need help creating a resume? Check out our resume builder. These are the basic reasons why the single page ideal has dominated the industry for years. The most important thing to be wary of in the case of the one-page resume is to not leave out essential information. It’s evident that there are more cons than pros of long resumes, which suggests that we should stick with the one resume page. You can make an exception in case you've got more than 10 years of experience and have many relevant jobs to include. If you've worked for brand names like Pepsi, Apple or Hewlett-Packard, you'd want to mention them all. The long resume would also allow you to go a bit more in-depth about your education if it's relevant. It's ok to go over one page but only when all the information is essential and you've cut out the fluff. Whatever you do, do not skip these points. After all, what good is a short resume that barely scratches the surface of why you are the perfect candidate for the job? Let’s have a closer look at these sections and see how we can optimize their length. It’s crucial to give the recruiter your email and phone number. 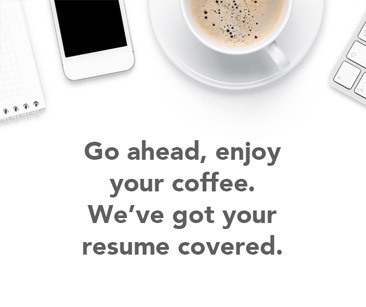 If they like your resume, they must be able to quickly pick up the phone and call you in or shoot you an email. Don’t play hard to get; this is not the time. The address serves as an indication of where you live which comes in handy when the job requires you to be in a certain field or perhaps means relocation for you. It is especially important for international candidates to pay close attention to the address they put down, as it has to be the permanent address. For example, if you are from Germany and applying for a job in the United States, your permanent address will be the one in Germany. While you may live in the States, the employer needs to know whether this is your permanent residency or whether you’re just in the country for a certain period of time. Make sure you get that call back! Check out How to Include Contact Information on Your Resume! The resume summary is a key part of your presentation. How long should a resume be in terms of summary? The ideal would be only 2-3 sentences. The length largely depends on how much experience you have. For example, if you’ve been in a certain industry for 10 years, you will have more to say than someone who just graduated. Concierge with 7 years of experience in boutique hotels. Easy-going and detail oriented, I always do my best to leave a great impression with guests and help ensure that they have a unique experience. MA in Hospitality and prior sales experience. You’ve got three concise sentences that tell us how many years of experience the applicant has, the specific type of hotels they have worked at, and their key qualities + education level. Recent graduate with 1-year experience in hospitality, always aiming to do my best to leave a great impression with guests. BA in Hospitality and sales experience. The second example has two sentences which tell us how much experience the candidate has, what their values are and the level of education. Want to master the art of the resume summary? Check out 5 Steps To A Killer Resume Summary + Real Examples! The experience section is the CORE of your resume. You have to make sure to show the recruiter right off the bat what it is that you focus on and how your previous positions tie to it. While the experience section should be detailed and longer than the rest of your resume, it should not be too long. For the jobs where you've had great achievements, do up to 6-10 bullet points. Otherwise, 3-6 is fine. Moreover, get rid of all the positions that are not relevant to what you are applying for. Let’s say that you are applying to be an accountant and you have three previous jobs in finance and one in hospitality. In this case, it’s a good idea to get rid of the hospitality job and only include your relevant past experience. This way, you save space and don’t risk confusing the hiring manager. Your education should be present on your resume but definitely not take up too much space. Unless you are applying for an academic position, your resume should only be mentioned briefly, as your experience matters more. The only exception to this rule is if you are a recent graduate and all you can show for professional experience are internships and summer jobs. If you have taken relevant courses to the job you are applying for and have graduated recently, it’s encouraged to add them to this section. For example, if you’re a recent graduate with a BA in Economics, and have only done summer internships, go ahead and put down courses like International Economy, Risk Management, Startup Entrepreneurship on your resume. Need some inspiration? Have a look at these resume templates. The awards and certifications section on your resume is only meant to enhance the overall strength of your candidacy, so don’t get too carried away here. Your awards and certifications have to be directly related to the field you are applying for. For example, if you are applying to be a tutor at a private school, mention the language certification courses you took and what score you passed them with. If you are applying for a sales job, mention that you’ve won an award for best sales leader and how your team reached and exceeded your goal (use numerical information). Want to know which accomplishments you should list to get the job? Check out How to Mention Accomplishments on Your Resume (10+ Examples)! Your hobbies and interests are a small but great addition to your resume. Companies want to hire like-minded people to the employees they already have, in order to strengthen the company culture. Ideally, this section would be no longer than 2 sentences. It should give a brief overview of the things you enjoy in your free time, but not turn into a memoir. If you are applying to be a writer, say: "My hobbies include reading fiction, interviewing strangers and analyzing old Russian literature." This tells the hiring manager that you have a rich imagination, aren’t afraid of going in the field and asking questions, and are analytical. A one-page resume is ideal. Keep it short and simple, but don’t take out essential details just to save a few lines. Revise the list of essential information that needs to be present and present each one clearly and concisely. Want to know exactly what to put on your perfect one-page resume? Check out What to Put on a Resume to Get you Hired (10+ Examples)!